Copper standards define the specific properties of copper and copper alloys. The use of standards is essential in the proper definition of the type, form and condition of an alloy; moreover, copper standards form a common language between producers, traders, and users of copper alloys. The globalization of the metals and manufacturing industries further increases the importance of being able to compare European, American, Japanese and other global copper standards. European copper standards are unified through a system developed by the Comité Européen de Normalisation (CEN). This system uses a six-digit alpha-numerical designation. The first letter, “C”, indicates a copper alloy. The second letter indicates the product form i.e. B - Ingot for re-melting to produce cast products, C - Cast products, F - Filler materials for brazing and welding, M - Master alloys, R - Refined unwrought copper, S -Scrap, W - Wrought products and X - Non-standard materials. Three numbers are then used to identify the material, and the final letter is used to identify the classification of individual copper material groups and to enlarge the capacity of the designation system. In North America, the standards for copper alloys are unified through the Unified Numbering System (UNS) which is managed jointly by the American Society for Testing and Materials (ASTM) and the Society of Automotive Engineers (SAE). Under the UNS system, coppers and coppers alloys are designated by five-digit numbers preceded by the letter “C”. The five-digit codes are based on, and supersede, an older three-digit system developed by the U.S. copper and brass industry. The older system was administered by the Copper Development Association (CDA), and in many documents and prints copper alloys are still identified by their “CDA numbers”. The UNS designations are simply two-digit extensions of the CDA numbers to accommodate new compositions. For example, free-cutting brass, once known as CDA Alloy No.360, became UNS C36000. UNS designations have been incorporated in the most relevant copper standards such ASTM, ASME, and SAE. In the UNS system, numbers from C10000 through C79999 denote wrought alloys, while cast alloy designations range from C80000 through C99999. Within these two categories, the compositions are grouped into distinct families of copper alloys, including the six major groups: coppers, high-alloy coppers, brasses, bronzes, copper nickels, and nickel silvers. Alloys not falling into one of these six branches are classified as “other copper-zinc alloys”, wrought compositions or “special alloys”, and cast compositions. Japanese JIS copper standards are primarily based on ISO Standards. The specifications begin with the prefix JIS, followed by a letter C for wrought copper and copper alloys and a four digit number which refers to the alloying elements that have been added. Examples: JIS C1020 which contains Cu 99.9%, JIS C2720 which is a Cu-Zn (brass), JIS C5191 is a Cu-Sn-P (phosphor bronze), JIS C3601 is a Cu-Zn-Pb (lead alloyed brass), JIS C6801 is a Cu-Zn-Al (brass), JIS C 4430 which is a Cu-Zn-Sn brass etc. 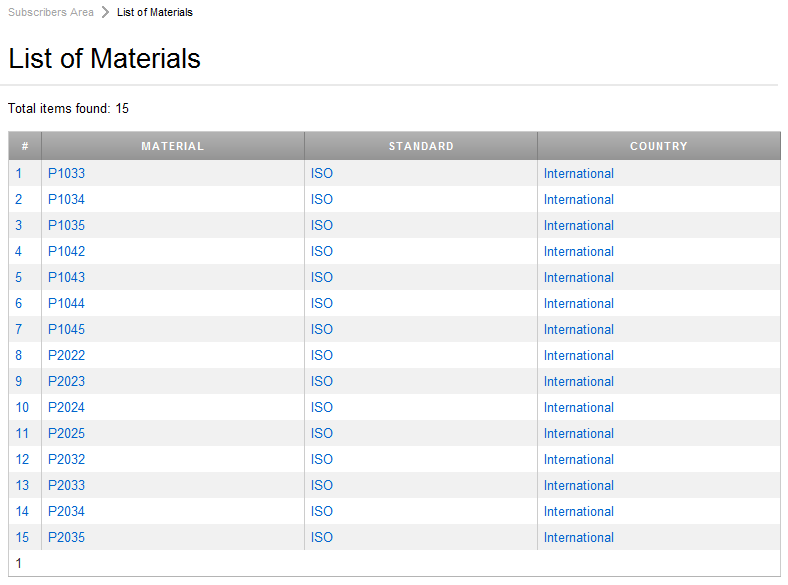 The Total Materia database brings global metal properties together into one integrated and searchable database. Quick and easy access to the mechanical properties, chemical composition, cross-reference tables, and more provide users with an unprecedented wealth of information. Click the button below to test drive the Total Materia database. With Total Materia, finding information about a copper standard specification, its current status and the materials it defines is one click away. By simply selecting a Standard Development Organization (SDO) and/or typing the standard number or even a keyword, you receive immediate results from the multi-lingual database with over 52,000 standards. For example, to find copper-related ISO standards, you can simply type copper into the Standard Description field and select ISO from the popup. The result list consists of a hundred ISO standards that include the word copper in their description; most of them define copper alloys and properties. Others of them describe other aspects, such as determining copper in other alloys and analytical methods. The information for each standard includes: standard description, year of last issue, current status (valid, replaced etc) and a hot link to the materials defined by this standard. 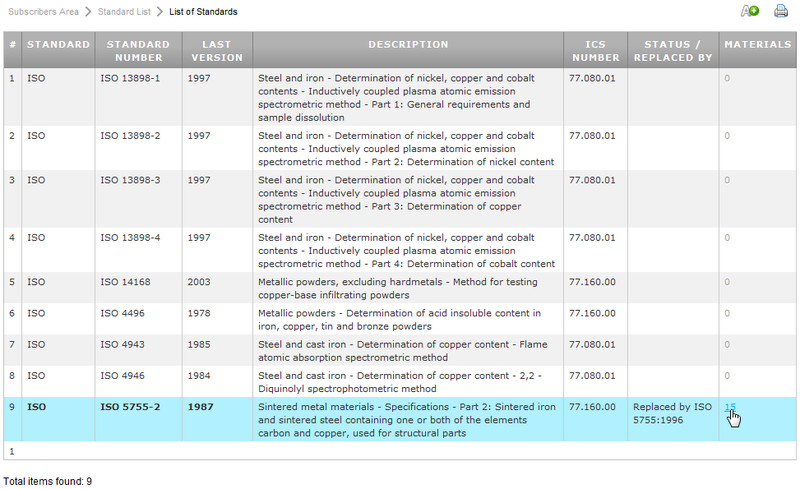 By simply clicking the material link, you can see the list of metal materials defined by the selected standard.